PLEASE NOTE THAT THE SCREENING SCHEDULED FOR SATURDAY, OCTOBER 2 HAS BEEN POSTPONED TO THE FOLLOWING SATURDAY, OCTOBER 9. 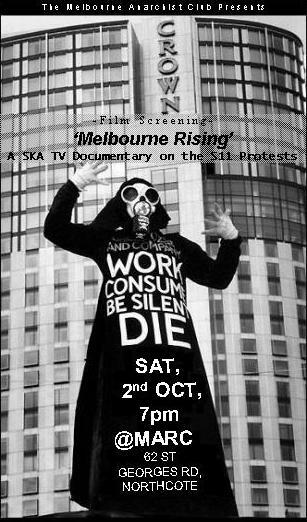 MAC presents a screening of the documentary film Melbourne Rising @ 7pm, Saturday, October 2 @ the 'Melbourne Anarchist Resource Centre' (MARC), 62 St Georges Rd, Northcote. The film documents 'S11': the protests and carnival against the Asia-Pacific summit meeting of the 'World Economic Forum' in Melbourne, September 11-13, 2000. The screening is a benefit for the Indonesian radical zine Amor Fati. For more information on the protests, see Reflections on S11 and AWOL.